Hannah and Radek have been friends since childhood. Will has just entered the picture, but both men will change Hannah’s life forever. Hannah and Radek plan on marrying when he comes home from university in two years, but each is free to check out the field until then. Hannah tries to remain loyal but when Will comes to work on her dad’s ranch, her attraction to him is impossible to ignore even though she tries as hard as she can. She is also determined to find out the real story of her mother’s death – was it on purpose or just a horrible accident. Hannah worries about the ranch that is the only life she has ever known - is her dad really going to sell the ranch and will he ever marry Lily? I really liked everything about All But What’s Left by Carrie Mumford very much. As we spend time with Hannah, her friends and family, it is impossible not to quickly become entwined in the story. The story is filled with passion and feeling from the very beginning until the final pages. I didn’t expect that ending. Hannah tells her story, jumping back and forth between the present and her childhood seamlessly. All But What’s Left is about emotions, love, family conflict, family love, friendship and watching Hannah's transformation into adulthood. It is hard to believe that this is the first novel by Carrie Mumford as it is so well written with wonderful characters and a plot that will keep you glued to your book/kindle. I think that everyone who reads All But What’s Left will be glad they did. It seemed that Hannah Tatum had always known her future, even before she had lived her present. She, Radek, nor anyone else had ever doubted the union of the two best friends, soulmates. When the time was right and after Radek graduated from the University of Texas, they would marry, start a family and run Stillwater Ranch. They had a plan. There was no room for deviation. When Radek announced that it would be good for them to “sow their oats” before finalizing their goal, Hannah rationalized that it only made sense, if only to him. With Radek firmly planted in college life, Hannah begins to question the many so-called truths of her everyday existence. The rumor around town that her father had murdered her mother years before begins to haunt her. The arrival of a handsome new ranch hand annoys her. The realization that her gal pals had dreams of their own confuses her. And, finally, the possibility of a severe disruption of “the plan” ignites conflicting feelings in her. 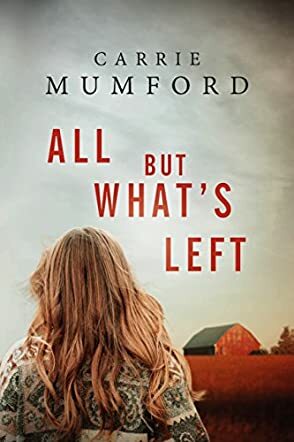 All But What's Left by Carrie Mumford is an easily read coming of age romance told with rich imagery and realistic dialogue. Mumford incorporates her story-telling with a fast moving plot that draws in the reader until the final pages. As the story unfolds, the dimensions of each character strengthen the passion reflected in the individual internal conflict, cementing the reality of a solid tale. An entertaining, yet thought-provoking read. How many times have you thought “what if”? Ever since she was a little girl, Hannah Tatum has tried to be the good girl, to blend in and not be noticed, to do what is expected of her, but now her father has pulled the rug out from under her feet by announcing that he is selling the ranch. This was where she had planned to live, once Radek was done with college and married her, right next door to his brother and the family ranch. Then there is Radek wanting to see other people while he is in college, and what about the new ranch hand. Even worse is the researcher that is digging into her mother's death. Hannah doesn't know what to make of it all and she doesn't do well with change. All But What's Left is the story of Hannah's life, told in different time periods, sometime going back to her mother's death, and at other times her and Radek growing up. Author Carrie Mumford creates a story with many levels of details, sometimes with many things all going on at once. All But What's Left looks at the death of Elizabeth Tatum, her husband's involvement or non-involvement, and Hannah's life afterwards. Hannah is the good girl, the one afraid to make a noise or draw attention to herself because she didn't want to be the girl whose dad shot her mom, the murderer's child, the little lost girl. She just wants to be normal, but that is hard to do in the small town of Jessop. Hannah is easy to relate to because most of us have wanted to hide in life at some point and not be noticed, but at the same time just accepting things as they are and never questioning doesn't make for a happy life. Finally it is Hannah's turn to question the status quo and what she wants in her life. There are some brief sexual affairs but they are probably less that what is on television today, so I still feel comfortable recommending this book to readers of all ages. It's a good story for young adults, to process what they want in life and not just accept what is laid out in front of them.